Tohoku, on the northernmost part of Honshu island, is known as the last frontier for backcountry skiing in Japan. Join Kenichi, a local JMGA mountain guide for 3 days of BC skiing in this remote location. 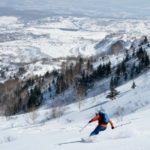 Welcome to the remote ski fields of Japan’s Tohoku region and enjoy a wonderful backcountry skiing experience! Tohoku lies at the northeastern end of the main island of Honshu and it’s only 2 hours away from Tokyo by bullet train. The starting point for our 3-day trip will be Morioka city. From there, I’ll take you to enjoy the mountains of the Iwate and Akita prefectures, both famous for their heavy snow. I’ll choose the best location for each day depending on weather and snow conditions. Besides, there are several historical and famous Onsen (hot springs) in these mountains, such as Matsukawa Onsen and Nyuto Onsen. Relaxing in this onsen every night after skiing will be an added bonus! In addition, Morioka City has a variety of restaurants including traditional options and many other options, including religious and vegan options. In Iwate prefecture we will ski mainly in the Hachimantai and Geto Kogen ski resorts. Geto Kogen is particularly famous for its deep and heavy snow! Hachimantai area: 1 hr drive from Morioka city. We will hike up to the summit of Mt. Chausu (1578 m) and do some freeride skiing. Geto Kogen ski resort: 1.5 hour drive from Morioka City. Hike up 20-30 mins from top of ski area for backcountry ski. This course includes tree runs. Skiers have to hike up again for 1 hr to go back to the start. If the weather is not good, we will go ski in Shimokura Ski resort, Nawabari Ski resort and use the lifts and ski in the tree areas instead. In Akita prefecture, we will go to the Mt. Akita Komagatake and Lake Tazawa ski resorts. Mt. Akita Komagatake: 1 hr drive from Morioka City. Ascend using a caterpillar (3600 yen 1 person) to the top of the mountain and then hike up to the summit. Clear weather is rare in winter. So, if you are lucky, you can stand on the summit and enjoy the stunning views below. Are you ready to explore these remote area in an exciting backcountry ski trip? Please contact me, I will be very happy to be your guide! 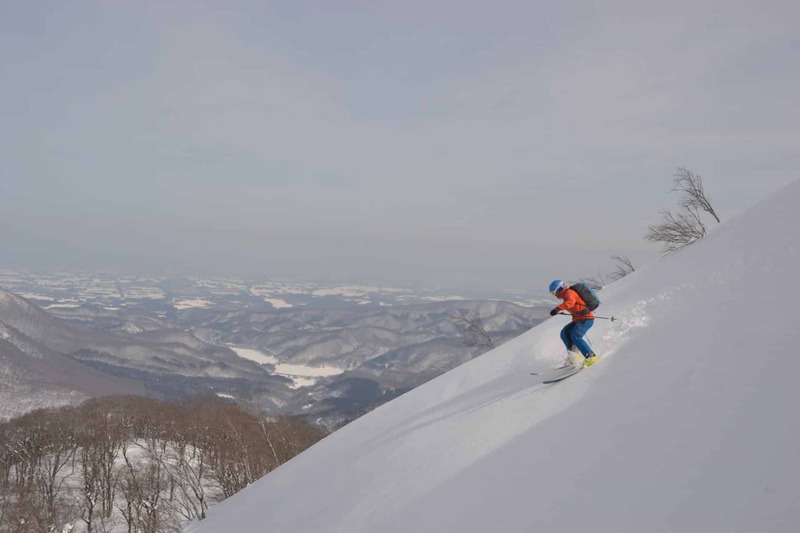 For other ski trips in Japan, you should also take a look at this freeride skiing in Gunma & Nigata programme. 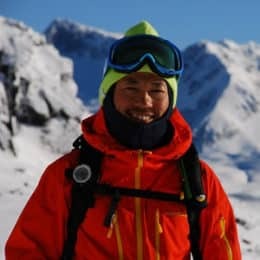 I'm a ski and mountain guide from the Japanese Mountain Guide Association (JMGA). I guide backcountry skiing, mountaineering, hiking and canyon climbing (Sawanobori) mainly on Honshu, the main island of Japan. When I was younger, I spent a couple of years in Canada and in Salt Lake City skiing and working as a rafting guide, as well as spent 2 summer seasons in Switzerland as a hiking guide. I started backcountry ski guiding when I based myself in Minakami and started one of the first backcountry ski guide companies in the area in 2002. I'm travelling every year to Europe and North America for ski trip with my clients. Please contact me if you wish to come to Japan and would like to enjoy our beautiful environment while doing an exciting outdoor activity. him and got to ski much more powder snow than if we had been by ourselves. I highly recommend him as a guide.